Benjamin Calvin. Photo by author. It’s a balmy Monday morning in January, and 17-year-old Benjamin Calvin isn’t at school. His attendance had been spotty since his senior year started the previous August, but after the winter break he stopped showing up altogether. 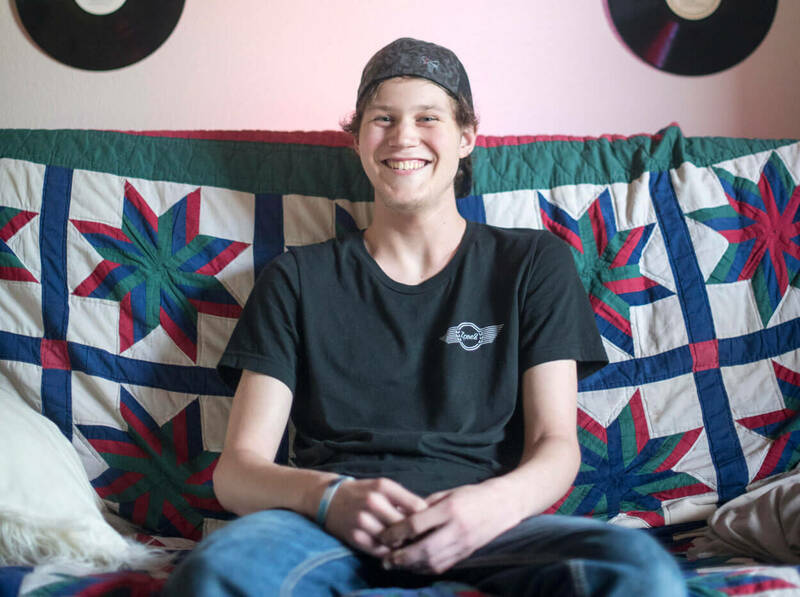 He says he’s in the midst of transferring to an online school, but just a month later, on his 18th birthday, he dropped out of that program as well. The Texas teen’s qualms with school were far ranging: He was bullied in middle school, his teachers moved too fast for him to keep up, and sitting still for long lengths of time was almost as torturous as the early morning start time. So when Benjamin, whose problems in school generally stemmed from a handful of sensory and learning disabilities, was arrested, charged with a Class C misdemeanor and expelled to a disciplinary school called the Alternative Learning Center in April of his junior year, it only solidified his opinion that his Austin-area high school—or any high school, for that matter—wasn’t the right place for him. This phenomenon of students being harshly disciplined and then failing to graduate or even winding up in the criminal justice system isn’t rare, especially in Texas, where schools spend more than three times as much on security as they do social work. Advocates call it the school-to-prison pipeline, and it affects tens of thousands of Texas students every year. The school-to-prison pipeline is a national phenomenon, which has been well-documented by civil rights groups across the country. The American Civil Liberties Union (ACLU) sums it up as “a disturbing national trend wherein children are funneled out of public schools and into the juvenile and criminal justice systems” through the use of police in schools, zero-tolerance policies and other strategies that criminalize student behavior. For example, until 2013, Texas kids could be charged with a misdemeanor for being disruptive in the classroom or on the schoolbus. And just like the criminal justice system at large, school discipline disparately affects students of color and students with disabilities. The U.S. Department of Education Office for Civil Rights found that nationally in 2011-2012, Black students with disabilities were suspended twice as often as their White, disabled peers. A report released by a social and economic justice advocacy group called Texas Appleseed last December found that between 2011 and 2015, 12 percent of tickets and 24 percent of arrests in the school districts that provided data went to special education students, which make up about 9 percent of the school population. Another study, authored by the Council of State Governments Justice Center, looked at six years’ worth of school records for nearly a million Texas students and estimated almost three quarters of special education students were suspended or expelled at least once in middle or high school. Benjamin, a lanky and cheerful teen with a dozen or so facial hairs that he seems to be growing into a goatee, has been diagnosed with Attention Deficit Hyperactivity Disorder, high functioning autism spectrum disorder (previously called Asperger’s Syndrome), and a couple of different learning disabilities. On his first day back from spring break last year, he found a small sporting slingshot tucked into the bottom of his backpack (he says he put it there a few days earlier and simply forgot about it) and decided to start shooting at an empty plastic water bottle during his lunch period. After a few shots at the bottle, one BB ricocheted off the floor and shattered a window in the school hallway. Though the damage was only $50, he was fined $400 for the misdemeanor, and because the school police officer found a pocket knife in Benjamin’s backpack when he was searched after the incident, he was suspended immediately. The expulsion came later. Any time a school wants to place a special education student in a more restrictive environment as punishment, they have to arrange a meeting between parents, teachers and administrators called a Manifestation Determination Review. At the meeting, using that student’s Individualized Education Program (IEP), a comprehensive document that lists the student’s disabilities, educational goals, and any accommodations necessary in their day-to-day curriculum, the group is supposed to determine if the incident in question is a direct result of the student’s disability or the school’s failure to implement their IEP. “The hallmarks of ADHD are impulsivity, poor choices, you know, these kinds of things that pretty much sum up what he did,” Benjamin’s mother said. But the committee that made the final determination disagreed. Benjamin was found fully culpable for his poor decision making and sent to the Alternative Learning Center—which advertises itself as a “school community built on second chances” for students with social and discipline challenges—for the remainder of the school year. Approximately a quarter of the school’s population are special education students. Dustin Rynders, a Houston-area attorney for Disability Rights Texas, says Benjamin’s experience is not uncommon. Rynders says instead of asking if a student’s disability manifested itself as misbehavior, administrators often take a more simplistic approach by asking if the student knows the difference between right and wrong. Though he did not represent Benjamin on his Class C misdemeanor case, Rynders knows how the unfortunate incident probably played out. And that’s to say nothing for the tens of thousands of Texas kids who are denied special education services. A 2016 Houston Chronicle investigation found that unelected officials set an arbitrary cap on special education at 8.5 percent of the student population in order to save the Texas Education Agency billions of dollars over the past 13 years. The Chronicle reported that teachers and administrators had been forced to deny “vital supports to children with autism, attention deficit hyperactivity disorder, dyslexia, epilepsy, mental illnesses, speech impediments, traumatic brain injuries, even blindness and deafness,” by diverting them to less supportive education programs—or by encouraging parents to take them out of public school altogether. “If it seems clear that the people at school are, at a minimum, not being sensitive to their disability related needs, or even worse, sometimes really promoting criminalization, well then, you know, you're going to think again about if going to school is that important,” Rynders said. According to the Council of State Governments Justice Center report on school discipline, nearly one third of students who were suspended or expelled were held back a year and almost one quarter of them came in contact with the juvenile justice system. Students that are arrested at school are nearly twice as likely to drop out. Cynthia Burrow, an education consultant from Round Rock, Texas, was stumped trying to navigate the tightrope that is special education and school discipline when it came to her own child’s education. Last year, when her son, who has been diagnosed with autism and placed in special ed, started the sixth grade, his behavior started to steadily worsen. It started with “escape behavior,” where 12-year-old Zach would try to leave class. Burrow says when that stopped working, he started lashing out— kicking at and pushing teachers and other students when they tried to touch him. Burrow says she was notified six or seven times that Zach had to be physically restrained by his teacher or a special education aide. The school pulled him from most of his classes, opting instead to send him to a “resource room” where he was secluded from the other students. Burrow had at least four meetings with teachers and administrators where she tried to explain that Zach has sensory issues, and the chaotic 1,300 person school often overwhelmed him, but that removing him from the classroom only reinforced his bad behavior. “I think that he really started to feel like he was a bad student and was not capable of being in school,” Burrow said. Though Burrow fought to get Zach additional help for months, she eventually agreed to send him to the GOALS Learning Center, Round Rock Independent School District’s “highly restrictive educational placement” primarily serving students with emotional disturbances, at the behest of his teachers and administrators. She did so only to get Zach through the rest of the school year; over the summer, the family moved to Massachusetts to get their son as far away from the Texas public school system as possible. But despite his tribulations, Zach was one of the lucky ones. Burrow says his special ed experience in elementary school was wonderful, and his grades and behavior have improved once again now that he’s adjusted to his smaller Boston school. Benjamin, on the other hand, still has a long road ahead of him. Once he dropped out of his online school, he had to move out of his parents’ house, and he’s using the college money his grandparents saved for him to help pay his bills at his new apartment. He works part time as a busser at a restaurant, but last time we talked he still hadn’t got his driver's license or GED. He’s also in the process of getting his record expunged, with the help of a pro bono expunction clinic at the University of Texas law school. Once he does that, he can apply for a second restaurant job without having to explain his past criminal record to employers. All-in-all, Benjamin is as happy as any other 18-year-old boy living in an apartment with his friends for the first time would be. He gets to sleep in every morning, and no one complains when he vapes in the house. But Miller still worries about how her son will fare when the novelty of adulthood wears off.